Hollandaise is an indulgent, buttery sauce that is an essential component of eggs Benedict but equally heavenly with asparagus, salmon or new potatoes. The sauce is an emulsion of egg yolks and liquid butter flavoured with lemon juice, salt and a little cayenne pepper and is notoriously difficult to get right. The trick is to heat the eggs enough so they thicken but no so much that they curdle. Our easy recipe below will help you achieve perfect results every time. 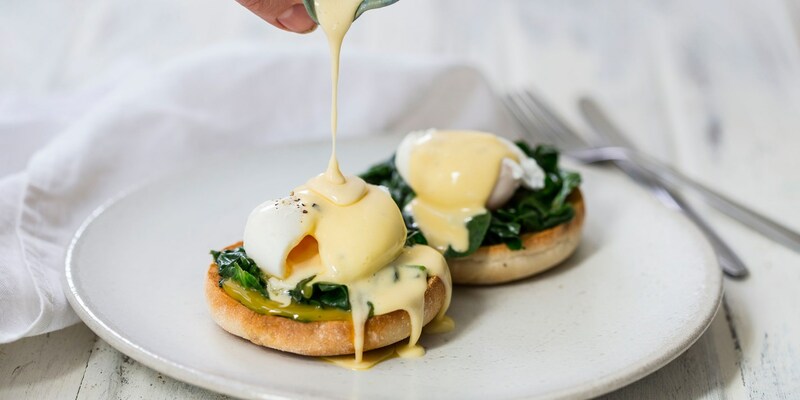 For Hollandaise sauce inspiration see Anna Hansen's Tea-smoked Alaska salmon, poached eggs, spinach with yuzu Hollandaise, Marcus Wareing's Crab Benedict and Geoffrey Smeddle's Feuilleté of poached quail's egg with Hollandaise sauce. Salmon and asparagus are also natural partners for this velvety sauce – see Graham Campbell’s Steamed salmon fillet with asparagus spears and red onion Hollandaise for the perfect combination of flavours.